To ask other readers questions about Cracking the PM Interview, please sign up. Having just added the title of "Product Manager" at my current employer, I needed to know what I didn't know. This book did a fine job of starting that process, but ultimately left me wanting. The essential job function is to keep your product moving forward. Because the programming staff is the engine for the machine for any software company, the need to "speak programmer" is first among equals. But you also need to speak management to executives, sales to field reps, artsy to design staff, and so on. You'll advocate for scarce resources to keep your ideas alive, own the accountability for any delays in the timeline, maintain vision for the grand picture during every minor release. And you have to do this with every indirect influencing skill in your arsenal. You don't have a staff who reports to you; you have an assembled team who unite (or not) under the common goal you champion. Required reading for prepping for PM interviews. Delivers on what it promises. But it perhaps underemphasizes that there are many other good ways to skin the cat. In addition to this book, I recommend also reading "Decode and Conquer", which will give you more example answers and offer different solid approaches/ways to think about the interview questions asked. Will these books alone make you a good PM? No. Gaining mastery over the concepts mentioned in the books and building good product sense Required reading for prepping for PM interviews. Delivers on what it promises. But it perhaps underemphasizes that there are many other good ways to skin the cat. In addition to this book, I recommend also reading "Decode and Conquer", which will give you more example answers and offer different solid approaches/ways to think about the interview questions asked. Will these books alone make you a good PM? No. Gaining mastery over the concepts mentioned in the books and building good product sense and industry knowledge will take much more time. Confidence, clear communication and persuasiveness are skills that are required to ace the PM interview (and be a good PM). Having an extroverted personality and business savvy will also go a long way. Ця невелика книга являє собою величезну кількість інформації для продакт менеджерів. Я рекомендую її прочитати, не залежно від того, чи плануєте ви проходити якусь співбесіду чи ні. З цієї книги можна “витягнути” велику кількість нових навичок та прийомів, які допоможуть вам не тільки покращити власну роботу але і почати насолоджуватися нею. Або нагадати собі про вже давно забуті речі. Книга класно структурує інформації і дає чудове підгрунтя для подальшого навачння. Це дуже освіжає читати книгу, Ця невелика книга являє собою величезну кількість інформації для продакт менеджерів. Я рекомендую її прочитати, не залежно від того, чи плануєте ви проходити якусь співбесіду чи ні. З цієї книги можна “витягнути” велику кількість нових навичок та прийомів, які допоможуть вам не тільки покращити власну роботу але і почати насолоджуватися нею. Або нагадати собі про вже давно забуті речі. Книга класно структурує інформації і дає чудове підгрунтя для подальшого навачння. Це дуже освіжає читати книгу, яка говорить дуже конкретні і дуже потрібні речі базуючись на цільовій аудиторії. Чесно, ця книга, напевно, одна з найкращих, які я прочитав за останній час. "It’s important to know what’s under the hood and have an interest in it. If someone doesn’t have any interest in the technical side, then maybe the technology field isn’t for them. How would you feel about teaching yourself some Java by buying a book, installing eclipse, and building a simple mobile app? If that would excite you, that’s great. If you think, “Do I really have to?” you’re probably in the wrong industry." "It’s often been said product managers are the “CEO of the product,” but, unfortunately, the popular wisdom here is somewhat inaccurate. You are not the CEO. You will not do acquisitions or mergers. You will not deal with shareholders. You will often not even deal with finances. However, you are responsible for delivering the best product to customers. Note this sentence covers three very important terms: “delivering,” “product,” and “customers.” Most PM questions revolve around these three terms." very detailed research ! the book should have annual sequel ! Addresses all areas and needs refresh cycle like all products do. This is the first book I ever read on product management. Great book for an extensive overview of how to market yourself, CVs and interview processes. Interesting to peak into the Top Tech (Google, Facebook, Amazon, etc) culture and recruitment process - which is not representative of the tech industry. *PM is responsible for making sure that a team ships a great product. *Prioritize - A 1% PM knows how to seq Great book for an extensive overview of how to market yourself, CVs and interview processes. Interesting to peak into the Top Tech (Google, Facebook, Amazon, etc) culture and recruitment process - which is not representative of the tech industry. *Prioritize - A 1% PM knows how to sequence projects. They balance quick wins vs. platform investments appropriately. They balance offense and defense projects appropriately. Offense projects are ones that grow the business. Defense projects are ones that protect and remove drag on the business (operations, reducing technical debt, fixing bugs, etc.). *The description of product manager as CEO misses the boat: product managers don’t have direct authority over the people on their team. As a PM, you’ll need to learn to lead your team without authority, influencing them with your vision and research. *One reason product management is such an appealing career is you get to sit at the intersection of technology, business, and design. You get to wear many hats and learn multiple points of view. While the product life cycle varies by company (and sometimes even by team), it usually follows a general pattern of Research & Plan, Design, Implement & Test, and Release. Of course, these frequently overlap and feed back into each other. *Some companies or teams split the product manager role across two people: the more business-focused person and the more engineering-focused person. When companies make this split, they call the engineering-focused person the technical program manager or technical product manager (TPM), and they call the business-focused person the product manager (PM). *While most roles on the team are crisply defined, product managers have a more fluid role. When you’re a product manager, your job is anything that isn’t being covered by other people. As a PM, you’re responsible for the success or failure of your product, and no job is beneath you. *Find teams where you can pick up new skills “Seniority is all about experience, but there’s a catch,” says Chrix Finne, a senior product manager at Optimizely (and formerly Google). “You can control how fast you accumulate experiences.” If you’ve mostly worked on improving a mature product, consider joining a team building a new, unlaunched product. If you’ve always worked on consumer-facing products, consider trying something business facing. Look at your skillset, decide which skills you need, and then find a place where you can learn those skills. *Nugget First The “nugget first” structure is a simple one. It means to start off your response with the “nugget”—or thesis—of what your story will be about. *Rule of 72: Here’s a fun and useful tip: if you need to calculate how long until something doubles, divide 72 by the percent increase. That is, an investment, population, salary or other value increasing at x% per year will double after approximately 72/x years. This rule works fairly well (being within 5 or 10% of the true answer) for smaller values of x. However, even up through a 100% annual increase (which is doubling within a year), the result is still within 30% of the actual answer. *Number of Digits: if you multiplied a and b together to get n, then the sum of the number of digits in the terms should be within one of the number of terms in the result. Or, more precisely: digits(a) + digits(b) = digits(a * b) Or: digits(a) + digits(b) = digits(a * b) + 1 For example, 823 * 1032 will have either 6 or 7 digits. (In actuality, it has 6 digits.) If you wind up with a number like 84936, you’ll know you’ve done something wrong. *In product design questions, pay attention to the details and be sure to ask probing questions. Microsoft interviewers often enjoy testing how you handle ambiguity. They might, for example, ask you to design a pen and not mention that it’s a pen for astronauts. They want to see that you ask a lot of questions to understand the customer before running down some path. *There are many frameworks to model the decision-making process, but two of the most common are AIDA and REAN. AIDA models customer decisions as Attention (or Awareness) -> Interest -> Desire -> Action. Attention: You need to get the customer’s attention somehow. A snappy email heading, perhaps? A snazzy ad? Or maybe a mention from a trusted friend or website? Interest: Now that you have the customer’s attention, you need to get them interested in your offering. What are the advantages or benefits of your product? Desire: With the customer’s interest piqued, you need to convince the customer that they want your product. Action: Finally, with the customer desiring your product, they take action to purchase the product. REAN expands this to add on post-purchase behavior. Reach: The customer is aware of your product. Engage: The customer is engaged and considering your product. Activate: The customer takes action to purchase the product. Nurture: The customer has purchased the product, and it’s now your responsibility to nurture this relationship. *The Rules Every rule has its exception, but they’re called rules for a reason. Proceed carefully if you think one of these rules doesn’t apply to you. *Knowing the “why” means understanding the following: Mission: Look up the company’s mission statement. How does it live up to this mission? Be specific. Strategy: What do you think is the company’s strategy? Are there any missteps with respect to that? Strengths: What are the product’s selling points? How does the company leverage those? What about the company or its products has enabled its success? Weaknesses: What are the major issues with the company and its products? How should the company address those weaknesses, or should they just accept them? Challenges: What are the biggest challenges for the company right now? How do you see them addressing them. the chapters on product and problem solving don't only improve your interviewing skills, it helps you think better and become a better product manager. moreover, this book helped me understand how to find a great pm when hiring. highly recommended for aspiring product managers, product managers, and hiring ceos. If you're thinking about starting your career on product management this is a great book to start. It not only helps you to know what an interview would be like, it also helps you to understand the position better and to know if it's for you or not. This book is very similar to it's much more well-known cousin "Cracking the Coding Interview". But due to the nature of the Product Management role, it doesn't suffer from many of the former's issues. As an engineer, I've not been paying much attention to the Product Management discipline. To add to that, I've found that this role is called by very different names and carries very different responsibilities in different companies. 1. What real This book is very similar to it's much more well-known cousin "Cracking the Coding Interview". But due to the nature of the Product Management role, it doesn't suffer from many of the former's issues. 1. What really is the difference between the Product Management, Program Management and Technical Program Management role? 2. What do PMs actually do? 3. Are PMs even necessary? 4. What makes a good PM? The book is structured very well. After describing and clarifying the various roles, it describes concrete examples of people working in these roles in well-known companies. It mentions their day to day life and professional histories. It is fascinating to see how people arrive at Product Management following very different paths. The problem with "Cracking the Coding Interview" was that the book came across as a giant compilation of typical interview questions. I felt that it did not really prepare readers to solve questions they hadn't encountered before. That is not a problem in this book. Due to the nature of this subject, it is not possible to simply list all questions and fixed answers for each. You really need to explain to the reader how they can answer these questions based on their own experiences. This eventually results in a more generalized book that can actually prepare you for yet-unseen questions. The sections on resume and cover letter are useful, but a little tedious to read. The final section lists a bunch of programming questions and how to go about solving them. Considering that this is not a huge focus in PM interviews, the authors have appropriately chosen to not go too deep or tackle overly complicated questions. A good resource, covers the gamut of what is a PM, what makes a good PM, what experience to gain, how to interview, and how to transition from adjacent roles like development of design. The format is quite choppy and goes from lists of companies to Q and A sections to example interviews. Though not the best for flow, it is mostly clear why a chosen style was selected, and it is generally with the most efficient way to present the information in mind. This style though off putting on a first read A good resource, covers the gamut of what is a PM, what makes a good PM, what experience to gain, how to interview, and how to transition from adjacent roles like development of design. The format is quite choppy and goes from lists of companies to Q and A sections to example interviews. Though not the best for flow, it is mostly clear why a chosen style was selected, and it is generally with the most efficient way to present the information in mind. This style though off putting on a first read, will likely lend itself for use as a reference book. My biggest complaint is grammatical errors throughout, that though not an impediment to comprehension should have been fixed in editing and mar the overall professionalism. A substantial portion of the book is devoted to big tech companies and their specific cultures/workflows surrounding PMs. Though helpful for those interviewing at those companies, it might have been better suited for the website. Overall I would recommend this book to anyone interested in Product Management. It does a thorough job, and is one of the only books I know of that so directly addresses the core of product management. Packed with useful information but not overwhelming, McDowell does it again with another MUST READ book for any individual in tech. The most useful components of the book were 1) the sample questions and 2) the example responses. As someone who learns best by seeing concrete examples, I felt that this book really helped solidify my confidence and knowledge about the PM role. For those who aren't the same kind of learner as me, McDowell accommodates through other methods of relaying the same skil Packed with useful information but not overwhelming, McDowell does it again with another MUST READ book for any individual in tech. The most useful components of the book were 1) the sample questions and 2) the example responses. As someone who learns best by seeing concrete examples, I felt that this book really helped solidify my confidence and knowledge about the PM role. For those who aren't the same kind of learner as me, McDowell accommodates through other methods of relaying the same skills. For example, she includes frameworks (with useful acronyms), as well as DO's and DON'Ts. I would advise annotating or taking notes simultaneously, though, if you are seriously hoping to absorb all of the information presented. Simply skimming sections won't help you, and some chapters might even be most effective if you DO the questions or activities presented on a separate sheet of paper. The main reason why I read this book was to learn more about data driven products from a product manager’s perspective; to have a different point of view in the way a products are conceived, implemented and launched in the context of tech companies. This book is an eye opener as to the diverse and complex tasks that product managers take responsibility for. This book also gives you great insights on what the working culture is like at big technology companies, and what background these companies The main reason why I read this book was to learn more about data driven products from a product manager’s perspective; to have a different point of view in the way a products are conceived, implemented and launched in the context of tech companies. This book is an eye opener as to the diverse and complex tasks that product managers take responsibility for. This book also gives you great insights on what the working culture is like at big technology companies, and what background these companies prefer in their PMs. At the same time, the authors go through good tips for interviews, which are helpful to not only PMs but anybody applying to tech companies, in my opinion. At times, these tips may come across as plainly obvious, but some of them are certainly new to me. For instance, I found the examples and tips on estimation questions to be original and very helpful. This book is bread and butter if you want a job in product management. Interviewers practically expect you to have read this (and many use this book to shape their interviews! ), and it's the first book in product management that any PM would recommend to you. In essence, the book gives structure to the largely generalist role of PM and the daunting, multi-faceted interview process. It's a great book to reference for areas that YOU need, rather than memorize tactics from. The book is best used as This book is bread and butter if you want a job in product management. Interviewers practically expect you to have read this (and many use this book to shape their interviews! 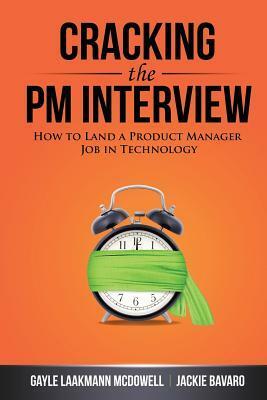 ), and it's the first book in product management that any PM would recommend to you. In essence, the book gives structure to the largely generalist role of PM and the daunting, multi-faceted interview process. It's a great book to reference for areas that YOU need, rather than memorize tactics from. The book is best used as a guide - to assess your strengths and weaknesses and then sharpen your clarity on the PM role and the interview process to land a new one. Having said that this is a good book for someone wanting to switch to software product management (non technical) with no prior experience in the industry. It explains various roles in an org and speaks of a PM's role in it even though it does not provide much depth. Things start getting interesting around the 50% mark, where the authors begin to cover the "meatier" PM questions like estimation & algorithm design (though the second isn't useful for many interviews. The first half was pretty standard interview prep, which would be good for those who have never interviewed before, but is old hat for those who have. (Examples include: what are your strengths/weaknesses, tell me about a difficult problem you solved, where do you see yourself in 5 years, etc.) Things start getting interesting around the 50% mark, where the authors begin to cover the "meatier" PM questions like estimation & algorithm design (though the second isn't useful for many interviews. - This book has some good condensed nuggets in it. Some are specific to Product Managers, but most can be extended to technical roles. - I really liked the CV examples and commentary. Specifics are great. - It already baffled me in McDowell's more famous book, but there is no need in my opinion to name and specify concrete company names (big tech companies like Google, Amazon, etc.). The takeaways are general enough to be applied to any company really. This is an amazingly thorough analysis of the qualities of good product managers. I think any product manager looking for career growth should make it a project to work through as many of the chapters and sample questions as possible. And where you don't have great/easy answers, you know what to work on. I would (and will) use this as an interviewer's guide as well, to find great future colleagues. I see this book as the introduction to those wanting to get into PM, but Decode and Conquer has better depth in terms of the types of questions asked. I also found this book's framework for Product Design and Improvement to be inferior to CIRCLES. That said, this book has more breadth in understanding what it's like to be a PM and what it takes. Read this for an intro to getting a PM job, then grind questions on Decode and Conquer. Cracking the Coding Interview is a book everyone in tech has heard about (if not already read), but I was surprised that Gayle wrote a PM one too! Want to land a PM/TPM position at a top company? Read this book. Great example questions and resume advice, and a detailed breakdown of the interview process for major tech companies (and I can attest to this book's accuracy on that front). This is a book I'll re-read anytime I'm looking for a new role or when I become an interviewer myself. There were a lot of spelling errors, many pages were cut during printing so you couldn't read the whole pages properly, and a lot of pages had faded ink. I thought I just had a badly printed book, but a friend of mine also owns the book and said it was the same. So the book was full of information, but poorly presented. This is rather insubstantial and unsatisfying though it did give me some clue of how PM hiring works. I would expect it to cover the knowledge and experience that you'd need to gain to actually get a PM job and perform it well. The discussion of interview questions doesn't seem like enough to prepare someone who isn't already prepared. Surely there must be much more to it. I thought this was a great introduction to what PM is (and is not), the possible paths of career transitions and important frameworks to excel as a PM (or PM candidate during interview). Clearly written like cracking the coding interview, in-depth industry research (although the valley moves real fast, so it's probably already a little dated), insightful takehome points and thought processes. At least as of 2017, this book seems spot on and had this book not been recommended to me, I would have assumed the content didn't exist. It's a must read for anyone getting ready for Product Manager or Microsoft Program Manager job search. Time to go update my resume. For those with a 3 or more years of experience as Product Manager this book may be just a review of a bunch of concepts and tips. However, for those who are starting as Product Manager or are PMs wannabes this book is a must read. But not because of the interview tips - IMHO this is the least important thing on this book - but because the concepts, tips and how to be a better PM. Good material for both - PM candidates & recruiters trying to hire PMs. If you are a Product Manager currently searching for a new job, then reading and applying tips found in this book should completely prepare you for an interview. If you are a recruiter, then this is a good place where to look for interview questions as well for tips how to evaluate answers to those questions. A great book into the world of product management, which until I read this book, remained an enigma to me. Allowed me to see more of what PMs do and what steps I can do to make the potential next transition in my career. Gayle Laakmann McDowell is the founder / CEO of CareerCup, and the author of Cracking the PM Interview, Cracking the Coding Interview, and Cracking the Tech Career. Gayle has worked for Microsoft, Apple and Google as a software engineer. She holds a bachelor's and master's degree from the University of Pennsylvania in Computer Science, and an MBA from the Wharton School. She currently resides in Pa Gayle Laakmann McDowell is the founder / CEO of CareerCup, and the author of Cracking the PM Interview, Cracking the Coding Interview, and Cracking the Tech Career.